To address concerns about synthetic and treated diamonds being mixed into parcels of melee, GIA has developed an automated system to analyze and sort melee-size diamonds quickly and accurately. 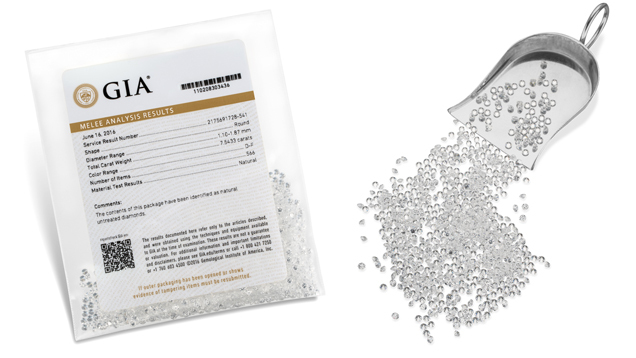 The GIA Melee Analysis Service separates natural diamonds from simulants, synthetic and HPHT treated natural diamonds, and sorts the screened diamonds by color range. Clients can also specify a size range for their parcel. Once sorted, the melee will be sealed in secure packaging for shipment back to the submitting client. Simulant - The contents of this package have been determined to not be diamond and are simulants. Synthetic - The contents of this package have been identified as synthetic diamonds. HPHT Treated Natural - The contents of this package have been identified as HPHT treated natural diamonds. *If no color sorting option is selected, this option will be used.